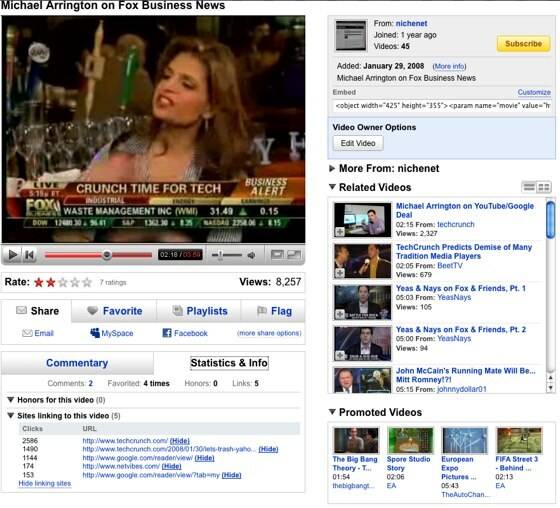 YouTube has quietly launch a new layout on video pages with a new tab focused layout and video statistics (pic above). The first change in the consolidation of Share, Favorites, Playlists and Flag into a dedicated tab driven box. The share tab expands out to give a more extensive range of sharing options which includes social bookmarking and voting sites (notably including Mixx), the ability to post a video to a blog, and send to the friend via email. Commentary (comments and video responses) is now offered in a tab next to “Statistics and Info.” Statistics provided are video honors (YouTube awards) and video referrals. It would appear that users can hide site referral statistics but they are turned on by default, at least for existing videos hosted on YouTube.